You've only got one spine. 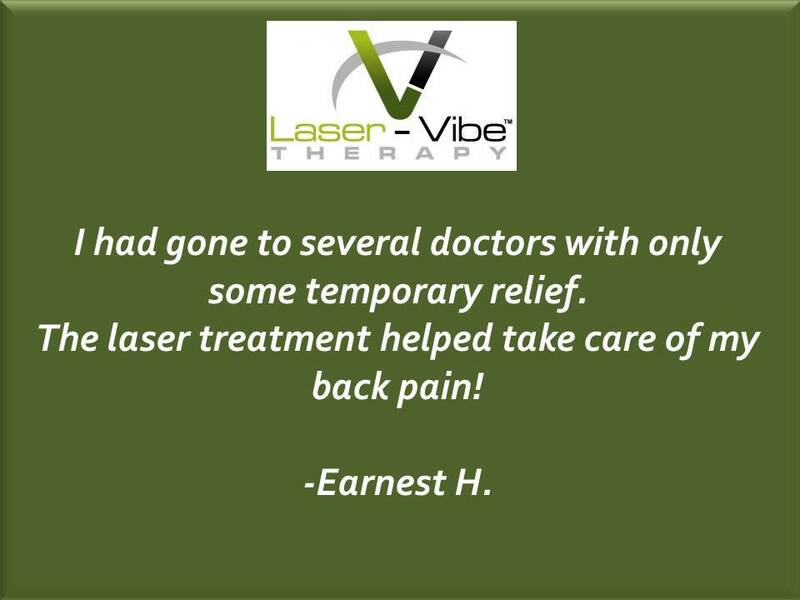 Take great care of it with gentle Laser-Vibe Therapy. Your journey to living without your chronic pain begins today. Call now for your FREE Consultation. It is possible to live without the pain again. Take your life back. Schedule your FREE CONSULTATION AND X-RAY/MRI REVIEW today! Limited Availability. Only 25 spots reserved each month! 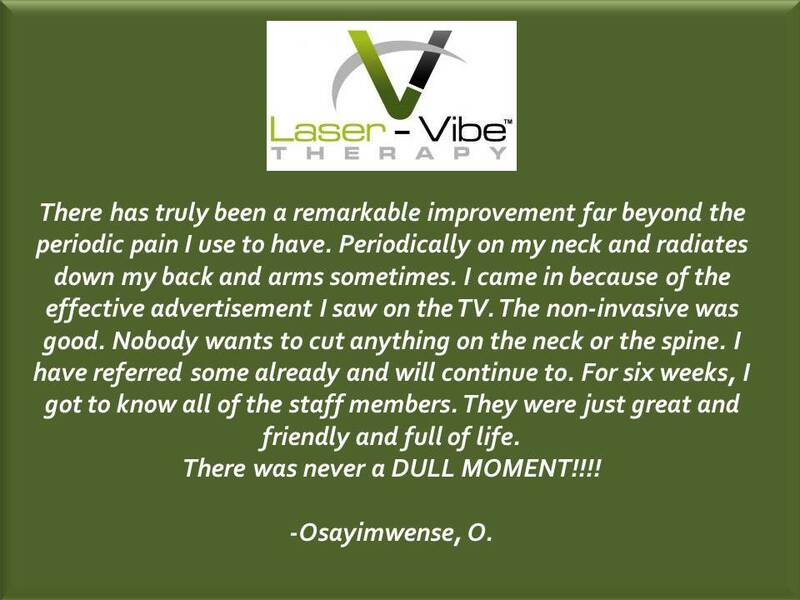 There is a very good reason why thousands of former chronic pain sufferers are calling non-invasive Laser-Vibe™ Therapy the BEST TREATMENT THEY'VE EVER RECEIVED FOR PAIN RELIEF! You gotta ask yourself... Wouldn’t it be great if “I” was finally PAIN FREE! 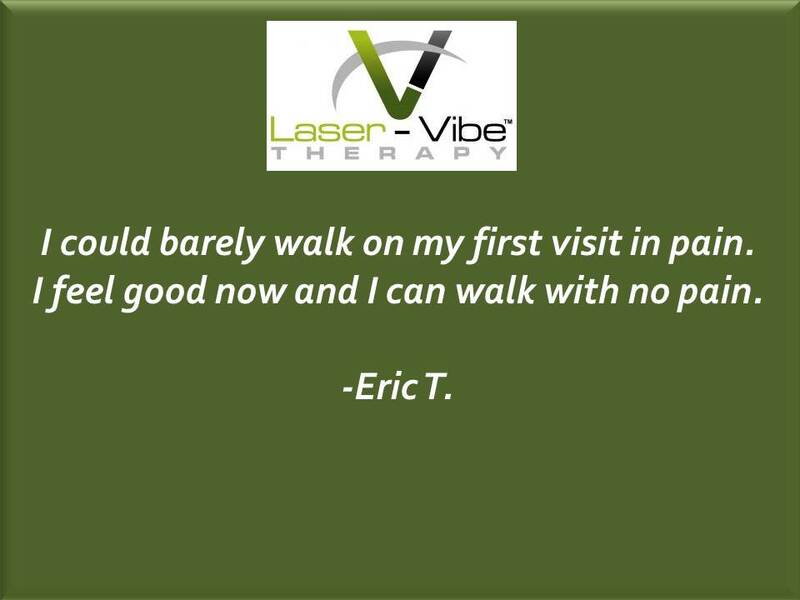 Keep reading below to see how you can experience for yourself exactly what our Laser-Vibe™ Therapy can do for you. We are Integrative Health, and we have been helping patients get out of pain for many years now. When other doctors would simply just try to refer these patients out to someone else… when other doctors said they couldn’t help… we raised our hands and said we will help you! WHEN ONLY THE BEST MODALITIES WILL DO! Since 2010, our office has been using the most state of the art modalities to destroy pain. Because of those modalities, along with our proprietary physical therapy protocol, we have helped thousands of people regain their life again! Patients often come back in tears because we have finally helped them get rid of their chronic pain! Nothing is more satisfying as a doctor than to know that we were able to help our patients take back control of their life with no more pain! 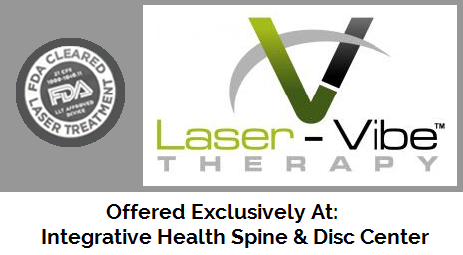 This treatment continues to be so successful because we don’t just have the lasers in our office and use them on just some of our patients… 100% of our patients utilize our specific protocol for advanced healing and faster recovery times, because our only focus is on chronic pain cases. Be weary of "copy-cats" out there. We've been perfecting and improving our protocols since 2010. 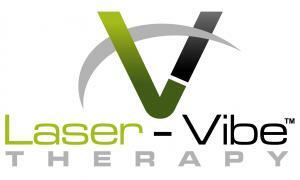 We are the ONLY LASER-VIBE THERAPY pain relief center in Virginia. 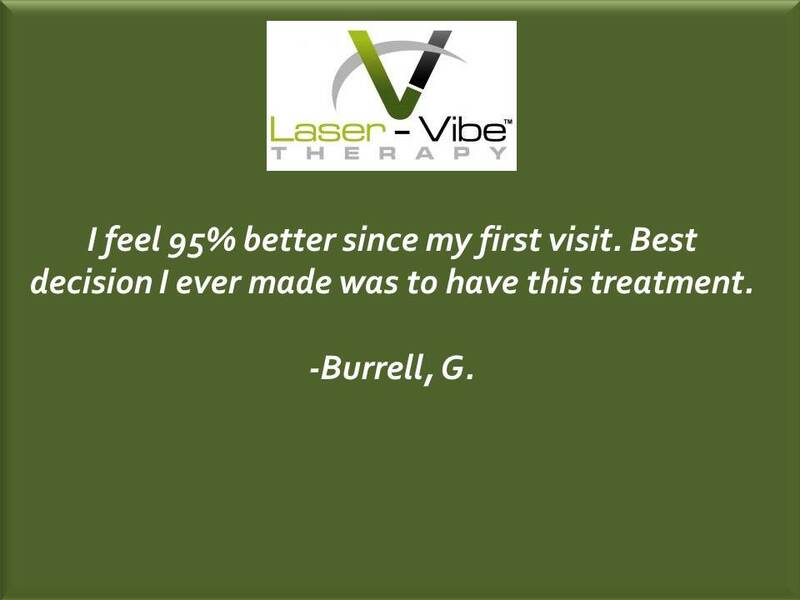 Our Laser-Vibe Therapy Program Has Helped Thousands Get Relief When Nothing Else Worked. 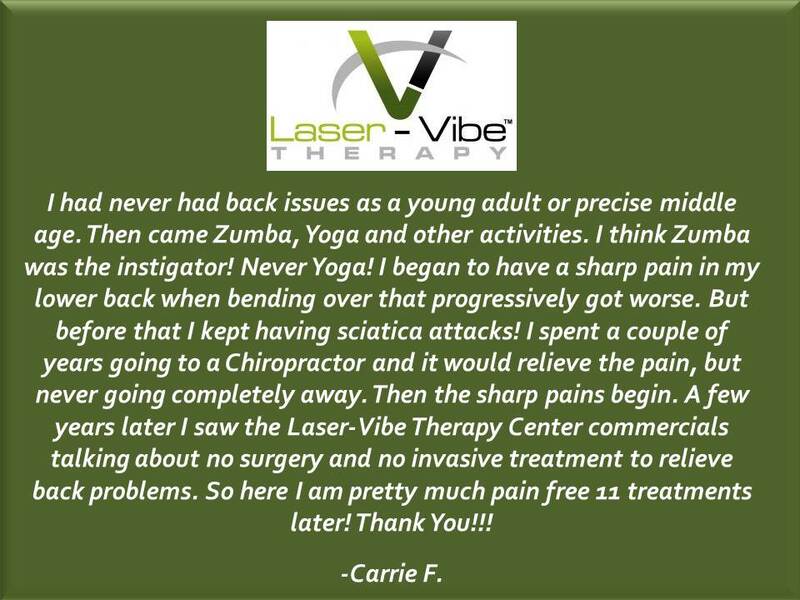 Our Laser-Vibe™ Therapy program helps in many ways. 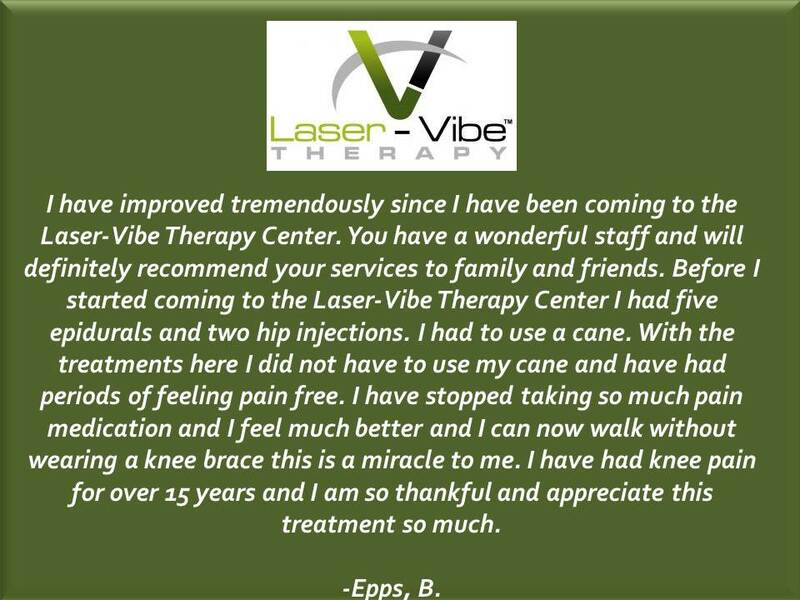 The lasers deliver deep, soothing, long lasting pain relief to the area being treated, while the WBV platform builds strength and balance like never before. More Results in Less Time! Not only will you finally have a chance to get rid of your pain once and for all… you will also be able to get the equivalent of a 30 minute to a 1 hour workout at the gym completed in only 10 minutes! Without having to over-exert yourself! So regardless of your pain, your weight, or how out of shape you are… you can finally take back total control of your health without the dangerous side-effects of drugs, meningitis causing injections, or painful surgery! STOP WHAT YOU'RE DOING... AND CALL OUR OFFICE RIGHT NOW! WE CAN'T KEEP THIS OFFER GOING FOREVER!!! **YOU WILL RECEIVE A CONSULTATION, EXAMINATION, AND EVEN X-RAYS IF NECESSARY... AND YOUR VERY FIRST TREATMENT! WE ARE NOT A RELIEF CARE OFFICE. WE ONLY WORK WITH CHRONIC PAIN CASES. IF YOU ARE LOOKING FOR A "QUICK" ADJUSTMENT, I'M SORRY, BUT WE ARE NOT THE OFFICE FOR YOU. THE DOCTORS WILL DETERMINE BASED ON YOUR CONDITION, WHICH TREATMENTS WOULD BE OF THE MOST BENEFIT FOR YOU. THERE IS NO OBLIGATION TO BEGIN CARE. Make sure to tell our staff that you are calling because you saw our website! Located in the heart of Glen Allen, VA, the leading health professionals at INTEGRATIVE HEALTH are dedicated to helping you achieve your wellness objectives -- Dr. Jason Hurst and Dr. Jackye Kim are committed to bringing you better health and a better way of life by always staying on the cutting edge of pain relief management. You can be sure to get the most current and most extensive care available. Live Pain Free Virginia! Call to see if you qualify! FIRST TREATMENT IS ABSOLUTELY FREE! 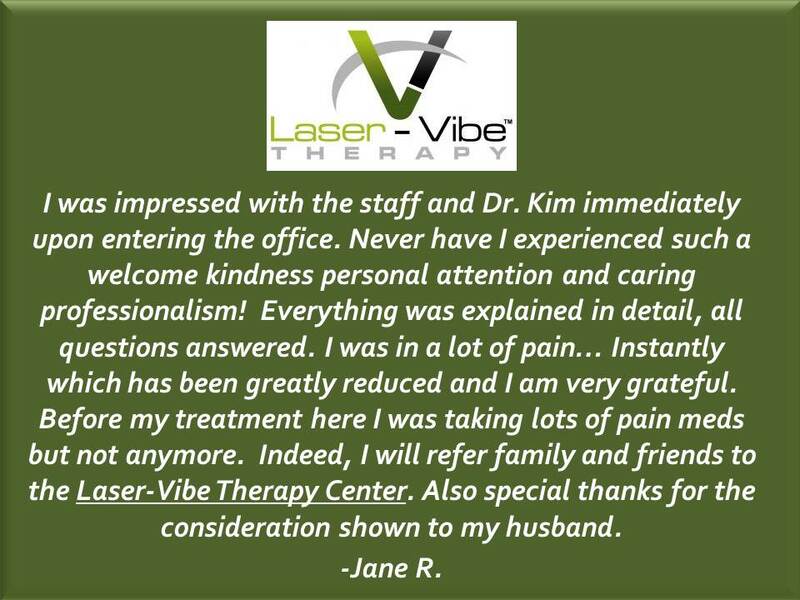 Utilizing our Laser-Vibe™ Therapy Protocol. You will receive a consultation, examination, X-Rays if necessary, and the first treatment for FREE. Services recommended for you after your Examination will be decided on, by the doctors. Not everyone receives the same treatment.